Obviously I loved it. I have also to say that the heroine is certainly one of the best character ever created in HRs; not necessarily because of her personality, which nevertheless I loved, but mostly because of how stupendously the author pictured her person and her story. Her struggles, her thoughts, her fears, her emotions are the most poignant. Nothing, like her story touched my core. 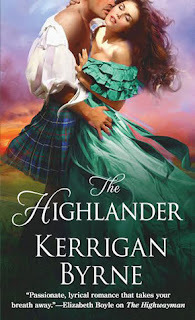 The first chapters, that most of the time are a bit slow and "boring" in most books, in The Highlander are among the most beautiful, they are so full of emotions, they give the reader a boisterous rush of empathy and admiration for the heroine. There is specifically a scene that was (and still is) so touching for me, where Mena is assailed by the fear she had been dreaming about being freed from the asylum. and piratical Blackheart of Ben More. Farah and Milli. Her new clothes, her new identity. white bathtub...was nothing but ice? [...]"
That said, I found everything else also so wonderful. I truly loved the hero, he's very different from Dorian Blackwell and Christopher Argent, especially the attitude towards emotions, in that he's slightly more similar to the hero in The Duke (number four in the series). Saying he's very passionate would be an euphemism, like for the others. As a reader you kind of experience this feeling of constant boiling throughout the whole Victorian Rebels' novels. And he's so heartwarmingly sweet, which you wouldn't expect from someone known as the Demon Highlander. If it was for me this series would last forever.